I recently took a 5-month break from my work as an environmental consultant to volunteer with Marine Conservation Philippines (MCP) on the issue of marine litter. During the first few months of my stint there, we undertook an intense programme of beach cleans across sections of a small sample of local beaches. The idea was to find out what kinds of material were most prevalent, to inform the types of local initiative we could set up to try and tackle the issues. Consistently, the vast majority of the debris we found strewn across the beaches was plastic; a significant amount of that was soft plastics which can’t be recycled – plastic bags, sweet and crisp packets, and single use soap and detergent sachets. There were some variations, though: at one beach, we kept picking up a staggering amount of styrofoam. During our beach clean work and engagement with local communities, it became increasingly apparent that part of the problem was the variability of waste management across the municipality of Zamboanguita, in the Negros Oriental province of the Philippines. Despite national legislation, some areas received no formal waste collections at all. With the help of the local Coastal Resources Manager, Tony Yocor, we began to engage with the local municipality’s Solid Waste Manager with the view to supporting appropriate an affordable waste management practices. We focused on solutions that have been successful elsewhere in the Philippines and in other emerging markets, such as the local collection and waste sorting approach developed by Mother Earth Foundation. Unfortunately, as with most places in the world, influencing the authorities to act takes time, and whilst we started to make some progress, Tony and the staff at MCP are still working on trying to get the full range of local solutions we identified implemented. We did, however, build our own ‘MRF’ (more of a community recycling centre in UK terms) at MCP’s base to improve the management of the waste we collected. The main aim of the site is to allow as many recyclable materials as possible to be segregated so that they can be sold to the local junk shops. We also hope that this can act as a demonstration site for the types of simple solutions that can be set up locally to improve waste management. But ultimately, if we are serious about tackling this issue of marine debris, we have to reduce the amount of litter we produce, and many countries are making progress on tackling commonly littered items. Restrictions on single use carrier bags are amongst the most prominent and widespread anti-littering measures around the world. England’s 5p carrier bag levy was introduced in 2015 and, despite its limitations, is reducing bag usage and (it would seem) marine litter. Last year Kenya hit the headlines when it joined the growing list of countries adopting a rather stricter line: it banned plastic carrier bags entirely, with offenders risking heavy fines or even imprisonment. Although bans and restrictions are becoming increasingly widespread, they have not yet reached the Philippines at a national level and it seems no coincidence that a large proportion of the items we found littered on our sample beaches around Zamboanguita were plastic bags. One beach, close to where the largest ‘ghetto’ market is held weekly, had a particularly high incidence of plastic bag litter, and the quantity increased noticeably on, and just after, market day. Without national instruments in place, we explored what could be done with the policy powers available to the local government. Working with the local Markets Officer and Coastal Resources Manager we put the wheels in motion to propose and implement a local ordinance to introduce a charge on plastic bags, initially at the market as a trial, with the potential for a wider roll-out if successful. It’s a model that could be reapplied elsewhere in the Philippines if national legislation isn’t forthcoming. Plastic bags are a challenge, but because they’re distributed locally it’s relatively easy to change practices. Other forms of single use packaging contribute just as much to the litter problem afflicting many South East Asian counties, but are harder to tackle because their source is more remote. The Philippines, like many developing and emerging economies, is a ‘sachet economy’, with a huge range of products sold in one-portion, single-use sachets. You see them everywhere, from small ‘sari sari’ stalls to large shopping centres. The producers’ perspective is that this form of packaging represents a form of social responsibility, allowing them to provide safe, long-lasting, affordable products that meet people’s needs. However, they have a wider cost. 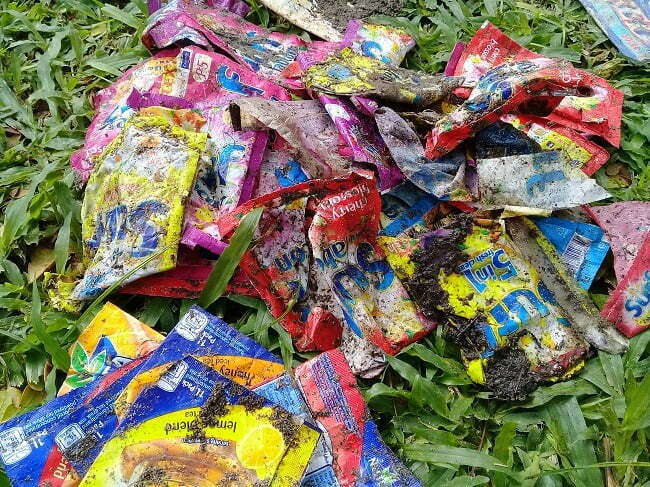 Sachet society: one of the most common forms of litter in the Philippines. Photo courtesy of Amy Slack. I was involved in Break Free from Plastic Negros Oriental’s December beach clean and audit, and these sachets were the most common item we found. They accounted for a massive 25% of the items picked up from Dumaguete beach, beating plastic bags into second place (13%). The waste management system in the Philippines simply isn’t geared up to dealing with this increasingly popular type of packaging – the composite materials of which they are made are impractical to recycle and so lack the economic value that engages the interest of the informal sector. So, what could be done to help? There is no ‘silver bullet’ to instantly lay marine litter to rest. Even if there was a global ban on single use plastics today, it would take time for already littered material to blow or wash its way through the system. However, introducing a compulsory extended producer responsibility (EPR) mechanism into policy could help end the blame game that currently impedes action: producers blame the general public for littering, the general public blame the government for inadequate waste systems, and government blames produces for manufacturing plastic packaging. An EPR scheme would see government giving clear responsibilities to business, and ensuring that producers fund collection and reprocessing schemes to properly manage the waste from the products they sell in the Philippines. That would in turn incentivise producers to use more easily recyclable packaging, as the costs of managing this material would be lower. The goal need not be to try to ape the waste management systems of the West, which may not be suitable in the circumstances. And in the Philippines, where labour is cheap and informal waste management thrives, it may take little more than giving a small value to packaging products to greatly reduce the amount of material that escapes into the environment. Although countries like the Philippines currently struggle most to cope with the consequences of plastic packaging waste, with the right set of policies and determined volunteers to help organise local action, there is scope for them to catch up and overhaul the West in developing solutions that really do reduce litter. Ecotourism has gained popularity as different states seek sustainability. It was one of the millennial goals at the global level, and many states have invested money and ideas into the project. Cyprus has not been left behind and has done a lot to promote a new form of ecotourism in the country. If you are planning to obtain a Cyprus immigration with One Visa, their agents definitely mention a few things about ecotourism in Cyprus. Now that you are reading this publication, you have come to the right place to get insights on a new form of ecotourism. Cyprus has a plethora of trained guides to lead you on nature walks. You can easily choose the destination from a list of many depending on what you want to view and experience. Some are best suited for the family while others are suited for explorers. For walks and expeditions in the forest and on the beaches, the guides will explain all the regulations that seek to protect the habitat by leaving it as natural as possible. Unfortunately, Cyprus’s government does not allow collection of souvenirs and artifacts. Cyprus still has people living in villages in rural areas. However, the villages are becoming smaller by the day, and the government is encouraging their growth. This is one way to preserve the original culture of the Cypriot people. The number of people who can take bus tours to the villages is highly regulated. If you would like to visit these villages, make sure that you book well in advance and follow the given regulations. Cyprus is an island and has breathtaking and clean beaches. The marine department is obsessed with maintaining the original form of both the beaches and the marine life. However, this does not mean that people cannot go to visit the marine life. The country offers guided tours to the beach, shallow sea and deep sea. Some of the best scenery can be found at the untouched shipwrecks and with the marine life that dwells in and around the shipwrecks. The diving tours are guided and regulated by the government to make sure that the untouched environment is maintained. Any tour in Cyprus cannot be complete without touring the historic and cultural ruins. However, have you ever wondered how these sites still exist or why they get recognized all over the world? It has taken great efforts to protect them and let nature take its course. Even though Cyprus has modern architectural buildings, none has interfered with these cultural and historic sites. They spread all over the island and carry a rich history for all people to enjoy. Finally, it is worth mentioning that Cyprus has zoos and modern parks that protect indigenous plants and animals. The public is allowed to visit under certain regulations. The government strives to preserve the country’s tourist attractions through the employment of ecotourism strategies. If you visit the country as a tourist or an expat, remember to check the regulations that govern ecotourism.